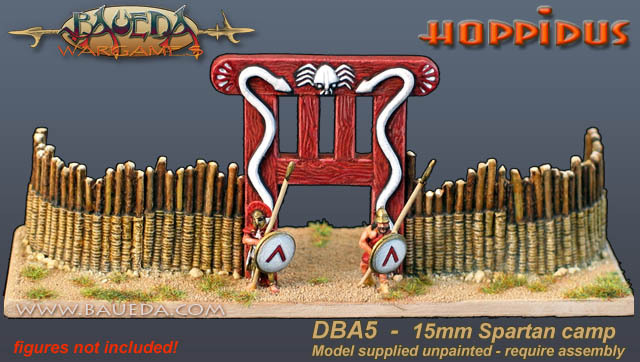 15mm DBA Spartan Camp AVAILABLE NOW! 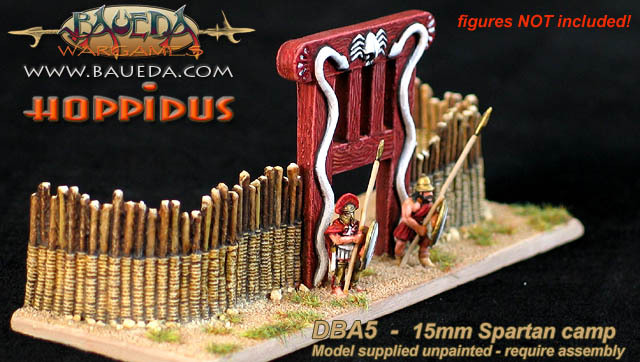 This is a model kit of a Spartan Camp set based on our "HOPPIDUS" modular system for ancient fortifications and designed specifically to be used with DBA rules. This set contains a selection of all the modules you need to recreate a sacred enclosure. 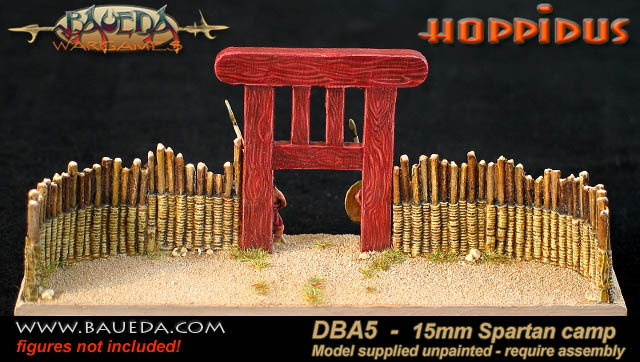 The complete set as shown here consist of a large Dokana which is used as gate to the enclosure and four sections of strengthen stockade, leaving ample space for a camp followers element to be placed within. The Dokana, or "beam-figures" were a symbolic representation of the brotherly love of Castor and Polydeukes, the military protectors of Sparta, and one (presumably smaller than that shown here!) may have been carried in front of the army on campaign. In the legends Castor and Polydeukes were twin sons of King Tyndareus of Lakedaimon, or sometime of Zeus himself, and their cult was centered in Sparta. There isn't much evidence to drawn on, but it is very likely that a Spartan camp, which probably consisted on little more than the men and their baggage, would include at least one small enclosed area that served as headquarters for all the military operations and religious ceremonies, and were the treasure and all important documents were kept. Such sacred enclosure would have certainly been put under the protection of the Gods, symbolised by a Dokana. This model is not therefore based on any direct source (there aren't) but all it's parts are accurate and historically correct to the best of our knowledge. 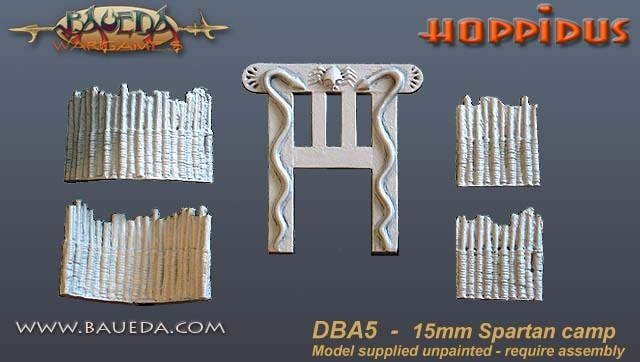 This kit include all the modules required to make a legal 120x40mm DBA camp large enough to hold an element of camp followers in the courtyard. It includes 5 parts, basic assembly instructions, guidelines and painting examples. Please note that the kit does not include (but does need) a base like that shown in the picture. You can make one yourself easily enough, so we didn't felt it was the case to charge you for a rectangular piece of cardboard!